Before entering or leaving the territory of the Republic of Uzbekistan, it is necessary to fill out a customs declaration of the T-6 form. 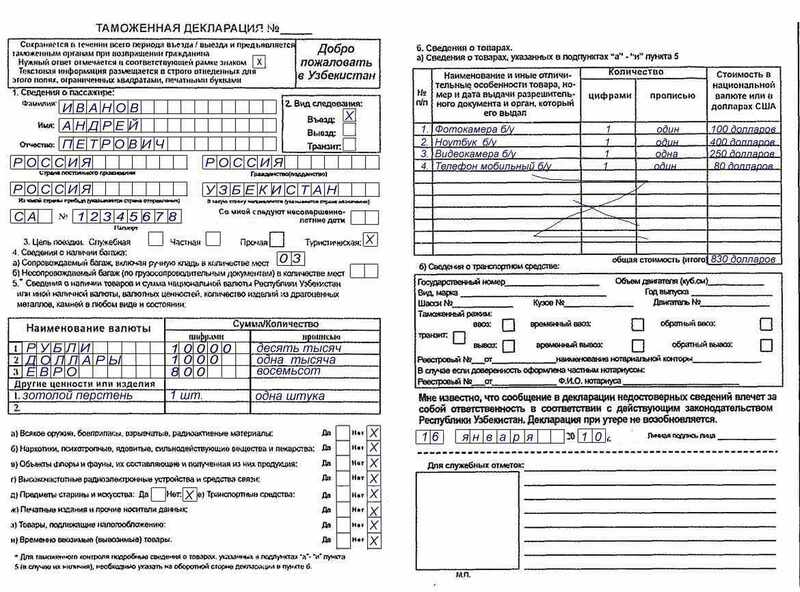 To fill out this form, you need to familiarize yourself with the Instruction “On the procedure for filling out and filing a declaration of the T-6 form” of the Ministry of Justice of the Republic of Uzbekistan, registered under No. 1342 of April 23, 2004. If you fill out the form, it is necessary to check it on the presence of errors, after printing in two copies and in A-5 size paper (in the size of 21×15 cm) on both sides.